Our 100% Pure Amagansett Sea Salt blended with dill and toasted fennel seeds. We used to call this blend "Bridgehampton Blend" because it reminds us of nearby Bridgehampton where lush green fields abut salt water. Think of this blend when you are cooking fish, poultry, and vegetables. 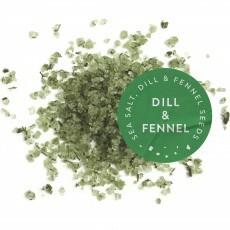 We grilled a hunk of salmon and topped it with this salt blend; the dill lent the perfect amount of "herbiness," while the fennel seeds chimed in with its distinctive flavor. A few crystals on my bagel and cream cheese the next morning made me wish we had some leftover salmon. We are completely obsessed with the [dill and fennel seeds] Blend sprinkled on roasted vegetables and in a Bloody Mary.